The Department of Statistics at UC Berkeley was founded by Jerzy Neyman (1894-1981). Neyman is considered to be, with R.A Fisher, one of the two founders of modern statistics. We present below an account of the early years of the department - from Neyman's arrival in Berkeley in 1938 to the foundation of the department in 1955 - written by Terry Speed, Jim Pitman and John Rice. This is an extract from a longer paper about the history of the department by these three authors which you can find at the bottom of the page. More information and resources can also be found here. In 1938, at the age of 44, Jerzy Neyman left the Department of Applied Statistics at University College, London and arrived in Berkeley to take up a position as Professor of Mathematics. His status as a leading scholar of his generation was firmly established by his paradigm-setting work in areas including hypothesis testing, confidence intervals, and sampling design. Shortly after Neyman’s arrival, he founded the Statistical Laboratory (Stat Lab), and this was to be the center of Statistics at Berkeley until the creation of a separate Department of Statistics in 1955, and the center of his activities until his death in 1981. As well as throwing himself into theoretical and applied statistical research, Neyman devoted a great deal of energy to teaching – for example, during the second semester of 1939-40 he increased his voluntary teaching load to 25 hours per week. In 1939 he recruited Elizabeth (Betty) Scott (1917-1988, BA 1939), an astronomer who had been auditing his course, as a research assistant, while in 1941 Evelyn Fix (1904-1965), a high-school mathematics teacher who had attended a summer session at Berkeley, joined the Lab as a technical assistant. Statistical work contributing to the US effort in World War II soon became the principal focus of the Lab, in particular extensive research on bombing patterns. When the war ended in 1945, Neyman was still the only Berkeley faculty member in the field of statistics. Well aware of the war efforts of many outstanding mathematicians and mathematical statisticians elsewhere in the US, he organized a symposium on mathematical statistics and probability “to contribute to the revival of scientific work in mathematical statistics and allied fields”. This landmark gathering featured contributions from Hotelling, Pólya, Wolfowitz, Doob, Hsu, Feller, and Neyman’s student, Erich Lehmann, as well as papers on the application of statistics to physics, astronomy, psychology, economics, forestry, animal breeding, rainfall, and insect populations. Hotelling’s keynote address “The Place of Statistics in the University,” and the ensuing discussion are as relevant today as they were then. Neyman returned with enthusiasm to teaching in Fall 1945, assembling a varied group of individuals to cover ten statistics courses. He led the team, and was assisted by Pao-Lu Hsu (1910-1970), his former student and later colleague from University College, London. At that time, they were the only two instructors with PhDs, and they were joined by Erich Lehmann, by then a graduate student in mathematics, who received his PhD under Neyman in 1946, as did Evelyn Fix (PhD 1948), John Gurland (1917-1997, PhD 1948) and Mark Eudey (1912-2007, PhD 1949). Two others came from outside statistics to complete the team: Elizabeth Scott, who received her astronomy PhD in 1949, and Edward Barankin (1920-1995), who completed a mathematics PhD on linear algebra in 1946. Four of the Fall 1945 instructors went on to become faculty in Mathematics and later Statistics: Lehmann in 1946, Barankin in 1947, and Fix and Scott in 1950, and another Neyman student from this era, Joseph L. Hodges Jr (1922-2000, PhD 1949) in 1951. Neyman persuaded the campus administration that he had good reasons to go against their policy of discouraging departments from hiring their own PhD graduates, arguing that few other universities were turning out students he considered to be satisfactory. Lucien Le Cam (1924-2000, PhD 1952) was the last of Neyman’s students to be appointed (in 1952) to the faculty. These six Berkeley graduates were joined by four outstanding outside appointments: Charles Stein (Columbia PhD 1947), a student of Abraham Wald, was appointed in 1947; Michel Loève (1907-1979), a student of Paul Lévy, came in 1948 from a position at the University of London and a visiting appointment at Columbia; Henry Scheffé (1907-1977) whose PhD was in mathematics, but had moved into Statistics and spent the academic year 1946-7 in Berkeley as a Guggenheim fellow, returned permanently in 1953; and David Blackwell (1919-2010), a student of Joseph Doob, visited Berkeley in 1954-55, and joined the department in 1955. We think of these ten as the department’s “founders”, as all but one was present when the department was founded in 1955, and remained there until their retirement or death. 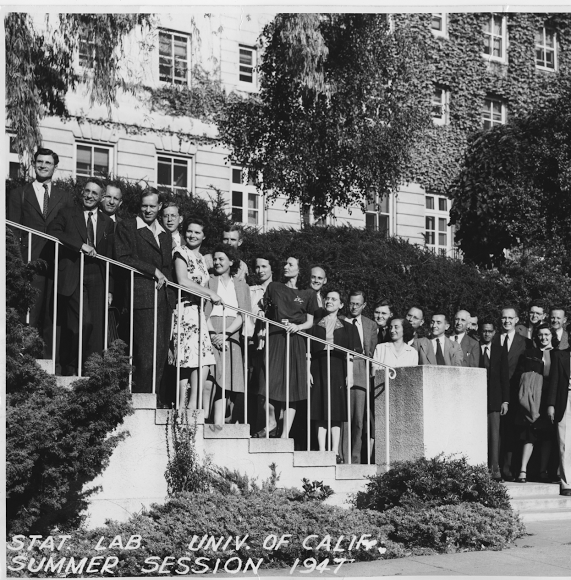 One notable event prior to formation of the Department was the 1949 California oath controversy, where faculty were required to sign an anti-communist loyalty oath. As is recounted in the books by Reid and Lehmann, this had a profound impact on the Stat Lab, and resulted in the permanent loss of Charles Stein to the University of Chicago and later Stanford. The Berkeley symposia continued as planned, the second in 1950 and the third in 1954-55, and Neyman even started his own journal, University of California Publications in Statistics, modeled on the Statistical Research Memoirs which he had earlier founded with E. S. Pearson at University College London. The Publications in Statistics ran from 1949 until 1963, and contained the PhD theses of many Berkeley statistics graduates from that period, and several important papers by Stat Lab faculty, including pioneering papers by Le Cam, but very few papers by outsiders. The story of Neyman’s relentless push for the creation of a Department of Statistics separate from Mathematics will not be recounted here. Suffice to say that Griffith C Evans (1887-1973), the long-running chair of Mathematics at Berkeley who had brought Neyman to Berkeley in the first place, and had supported him in most of his efforts after his arrival, had an opposing vision, one of a broad-based Department of Mathematics encompassing all of the mathematical sciences. On Evans’ retirement in 1949, the way became clear for the formation of a separate department, and it eventually came into being in the fiscal year 1955-56. A brief history of the Statistics Department of the University of California at Berkeley, by Terry Speed, Jim Pitman and John Rice. (December 2012). Video: Professor Erich Lehmann, The Early History of the Berkeley Statistics Department. Jerzy Neyman Room; November 7, 2005. Recorded by the SGSA. We frequently receive inquiries about biographical information for Dr. David Blackwell. To accommodate these requests we have compiled an informational packet that includes past interviews, a bibliography and some biographical information.